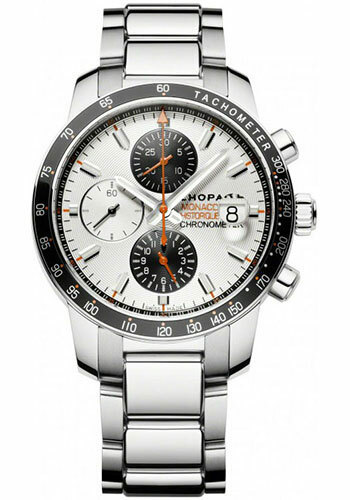 42.40 mm stainless steel case, sapphire crystal back,tachometer scale bezel , silver dial with black subdials, automatic self-winding COSC movement with hours, minutes, small seconds, date, chronograph's hand, 30-minute counter, and 12-hour counter, approximately 48 hours of power reserve stainless steel bracelet. Water resistant to 50 meters. 42.40 mm 18K rose gold case, sapphire crystal back,black bezel with tachometer scale, silver dial with black subdials, automatic self-winding COSC movement with hours, minutes, small seconds, date, chronograph's hand, 30-minute counter, and 12-hour counter, approximately 48 hours of power reserve, hand-stitched leather strap. Water resistant to 50 meters. 44.50 mm titanium and stainless steel case, Monaco Automobile Club stamp on the back,tachymeter bezel , snailed grey dial with yellow racing ring, automatic self-winding COSC movement with chronograph, hours and minutes, small seconds, date, chronograph seconds hand, 30-minute counter, 12 hour counter, approximately 46 hours of power reserve, black calfskin barenia leather strap with titanium folding buckle. Water resistant to 100 meters. 42.40 mm stainless steel case, sapphire crystal back, with tachometer scale silver dial, automatic self-winding COSC movement with hours, minutes, small seconds, date, chronograph's hand, 30-minute counter, and 12-hour counter, approximately 48 hours of power reserve, Barenia Racing style strap. Water resistant to 50 meters.